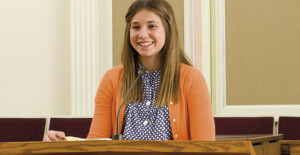 If you are a Latter-day Saint, you have likely had the experience of giving a talk in sacrament meeting. Both preparing and giving the talk can be intimidating, but luckily there are some great resources to help you both prepare and give a meaningful talk. The LDS.org page Speaking in Sacrament Meeting has sections on how to prepare, how to teach by the Spirit, how to organize your thoughts, and how to speak from the heart. It also has tips for preparation and delivery of the talk. The Gospel Topics section of LDS.org has links to some of the best resources on LDS.org, such as general conference, magazines, and scriptures. The page Ten Tips for Terrific Talks has ideas to help you prepare and deliver your message better. LDS Living has also published a list of 5 Ways Not to Start a Sacrament Talk, with ideas on what to do instead.